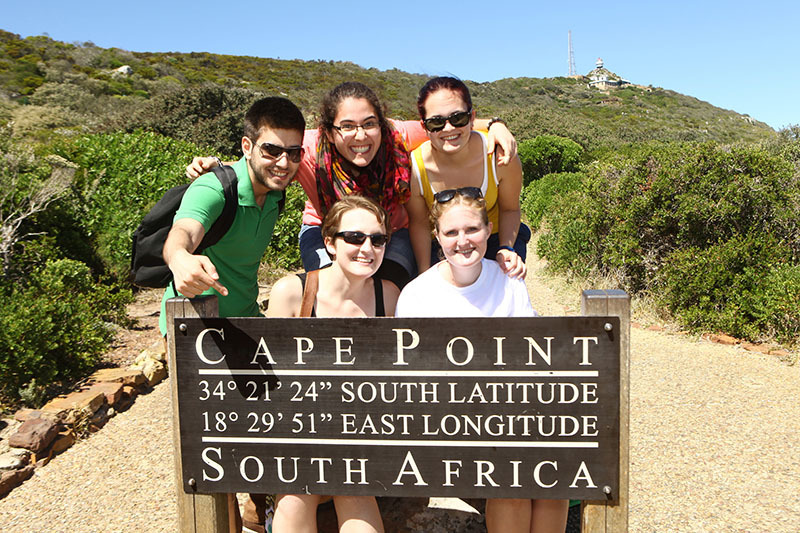 Learn English in Cape Town at our partner school Good Hope Studies. This school has two locations, one in the city centre (in a beautiful office building in the pedestrian walkway of St. Georges Mall), and the other location called Newland campus, which is a private building in a leafy, upmarket residential area of Newlands. Newland campus: Close to the school you can find shops, restaurants, bars and various sports facilities. Apart of classrooms, student lounge and lending library, the school has a large garden and outdoor pool. Popular beaches and the city centre are just 20 minutes away by public transport. There are many options for the intensive course: 16, 20, 26 or 30 lessons per week. The lessons include grammar, reading, writing, listening and vocabulary extension, with a strong focus on communication. An emphasis is placed on real-life situations through role-plays, conversations, interviews, and simulated telephone dialogues. Students have a choice of 16 lessons per week (Mon - Thu) or 20 lessons per week (Mon - Fri), which are held in the morning (from 09:00- 12:40). In addition to these lessons of general English, students can book additional afternoon options ("Focus groups"), to reach a total of 25 of 30 lessons per week. These afternoon classes are not suitable for absolute beginners. The Focus Groups, unlike the morning classes, are designed to mimic the world beyond the classroom where communication happens between people with a varied command of English. Focus group classes, therefore, accommodate a mix of levels: strong Beginners mix with Elementary students in Survival English. The other focus groups mix students from Pre-intermediate level and higher. Course can start on any Monday with basic level, for beginner level please see beginner starting dates. A double room can be only booked for 2 people travelling together. Private bathroom on request for a supplement: 30€ per person / per week when staying in a twin room and 50€ per week when staying in a single room. Please indicate on the booking form if you wish to book this option. Accommodation Damage Deposit: A deposit of € 100 against room damages is collected on the first day of school. The deposit is returned to the students (unless any damages are done), upon their departure. The minimum age for staying in this accommodation is 18 years. The minimum age for staying in this accommodation is 18 years and the minimum duration is 4 weeks. The price mentioned above is for for a one-way transfer upon arrival. It is compulsory to book a transfer on arrival when booking accommodation. In case you wish to also book a transfer on departure, please indicate this on the booking. Important: The teaching materials are not included. Students are required to purchase a course book on their first day of school at reception (approx cost € 20 - € 38). Every 10 weeks, the course book changes. Students who require a course book for only 3 weeks or less can rent a book at no extra costs. In 2019 the school is closed on: 01/01/2019, 21/03/2019, 19/04/2019, 22/04/2019, 27/04/2019, 01/05/2019, 08/05/2019, 17/06/2019, 09/08/2019, 24/09/2019, 16/12/2019, 25/12/2019, 26/12/2019, 01/01/2020. Only one-to-one lessons will be rescheduled. If the first Monday of your course is on a holiday, lessons start on Tuesday. The combined course is specially designed for those participants who would like to study in a group, yet at the same time have some private lessons for their professional or personal needs. 25 lessons per week, daily 4 lessons + 1 individual lesson. Course can start on any Monday with basic level. For beginners, please see the beginner level starting dates. The commercial English course is recommended for students who use English mainly in business situations. This course combines an intensive course of 20 lessons with 10 business lessons per week. The afternoon business lessons cover the language skills needed in the work place such as negotiating, telephoning, presentations, writing reports, etc. Minimum age is 19 years . Cambridge examination certificates are English language qualifications which are recognised and highly valued by many employers around the world. The school is one of the leading providers of Cambridge exam courses in Cape Town. The courses are run by specially trained teachers and are offered as closed courses. From beginning to end all lessons have one dedicated goal: the offering of the best possible preparation. Small class sizes ensure personal attention for all participants and 25 hours of lessons per week (9 or 10 weeks) ensures a high pass rate. The exam can be taken in Cape Town after the course. Depending on the exam date, you will have to require an extra week of accommodation for the exam. Prices not included and available upon request. Please contact StudyTravel for more information about exam dates and starting dates. The prices of the Cambridge exam courses do not include the exam fee (aprox. 160€) nor the teaching materials (aprox. 75€). The IELTS course can be taken for 4 or 8 weeks, consisting of 20 lessons of General English + 10 lessons of exam preparation per week. The students work on test examples and improve basic communication skills such as speaking, reading, writing and listening. The overall goal of this course is to be well prepared and pass the IELTS exam. The IELTS exam often takes place on Saturdays. Therefore, it may be necessary to book an extra night (staying until Sunday). If you are interested in taking the IELTS exam at the end of your course, please contact us for the appropriate starting dates. We also inform you about how to register sufficiently in advance via www.ielts.org. The exam fees are not included in the prices below. The exam fees for the IELTS exam are not included (€ 221). The TOEFL preparation course can be taken for 4 or 8 weeks, consisting of 20 lessons of General English + 10 lessons of exam preparation per week.The overall goal of this course is to be well prepared and pass the TOEFL exam. If you are interested in taking the TOEFL exam at the end of your course, please contact StudyTravel. We will inform you about how to register sufficiently in advance via http://www.ets.org/toefl. Click here for more information about the TOEFL exam. Exam fees are not included in the course price (aprox. € 203). One-to-one course lessons are ideally suited for students who want to improve as quickly as possible and want the maximum in personal attention. In these lessons you can specify exactly what you would like to focus on. The exact needs within the focus of study are established at the beginning of the course through a needs analysis. Throughout your stay your needs will constantly be assessed to take into consideration your changing requirements as the course progresses. Staying with a host family offers an insight into the South African life-style, while giving you the opportunity to reinforce newly acquired language skills. A host family can be a traditional family, a young couple or a single woman. However, what they have in common is their interest in meeting people from all over the world and quickly making them feel comfortable. Many families are within walking distance of the school or within a few stations by Metrorail. You will be staying in a single room, double rooms are only available for people traveling together. Lodging is based on half board. If paying a surchage, rooms with private bathrooms are available. The student residence is ideally situated in a popular student district close to pubs and restaurants and at approximatly 20-30 minutes by Metrorail from both school locations (City Centre or Newlands). There are 2 buildings, 1 for male students and 1 for female students. The single rooms are basic, yet with modern furnishings and 5 rooms share one bathroom. It is the right choice for those who are young, or feel young, and wish to be more independent. The kitchen is shared by other students who you live together with. Lodging is based on no meals, but it is possible to book breakfast, lunch and dinner whilst there. Students from the university also live in the residence. The school residence is a house in an attractive suburb of Cape Town, at 15 minutes walking distance from the school building in Newlands. The distance to the other school location in the city centre is 30 minutes by MetroRail. There are double rooms available with shared bathroom. The students further share the living room with TV and DVD, kitchen and garden with swimming pool. Travelling to the city centre of Capetown takes about 30 minutes by metrorail. Minimal stay is four weeks. Situated right next to the school building in Newlands, and accommodating 14 students, this is an upmarket house on a large property, with a garden, a swimming pool and a veranda. There is a self-catering kitchen and large community room. You will share a room with 3-4 students. The students share 4 bathrooms in total. The main shopping areas for the southern area as well as restaurants, pubs, etc. are within walking distance. Location: nice residential area in walking distance (10 minutes) to a commercial centre. Meals: Self-catering facilities are available for students to prepare their own meals. Laundry: A washing machine is available free of charge. Facilities: A dining room, lounge with TV and DVD, Wifi and a garden with a swimming pool.